The beginning of a new storyline accompanies a number of small changes. Guild Wars 2 has been out for about five months now, so if you picked it up at launch, chances are you've worked your way through a good deal of the content by now. If exploring Tyria and advancing its high fantasy story have lost their luster, ArenaNet has a fix for you: a substantial content update coming on January 28. In addition to a number of additions to achievements, tournaments, and gear shops, the update will kick off a brand new story arc entitled "Flame and Frost." First things first: The prelude to Flame and Frost "is the prologue to a multi-stage narrative that will bring big changes to Guild Wars 2 in the months to come," according to its official site. "The sky falls and the ground shakes in the lands of the north ... The call goes out for volunteers to assist the victims in this time of need, when earth and sky seem to have become the enemy." 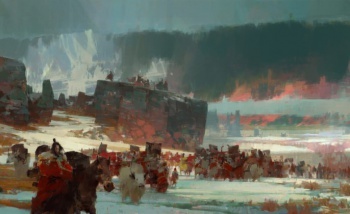 ArenaNet seems loath to spoil much else at this point, but if you plan to embark upon this new set of quests, prepare for assisting refugees and likely heading north to do battle with something nasty. If you'd rather just knock some heads, that's OK, too. From January 28 to February 4, the Temple of the Silent Storm map with smaller teams will replace the regular proceedings in the arena, thereafter becoming a part of the regular map rotation. ArenaNet also plans to add new achievements, which award laurels. So that you don't have to sit on your laurels (I'll show myself out now), a selection of improved infusions and amulets will be available for exchange. Throw in a number of smaller fixes, tweaks, and real-money vanity items, and Flame and Frost should satisfy any Tyrian adventurers who have been itching for something new to try. If there's any content you want to finish up before taking on a new set of quests, you've got a week to do it.